Yesterday’s rainy afternoon in Oklahoma would have been perfect for a final round of the Masters – here’s to a PFB community-wide Sunday golf nap and watching Rickie compete. 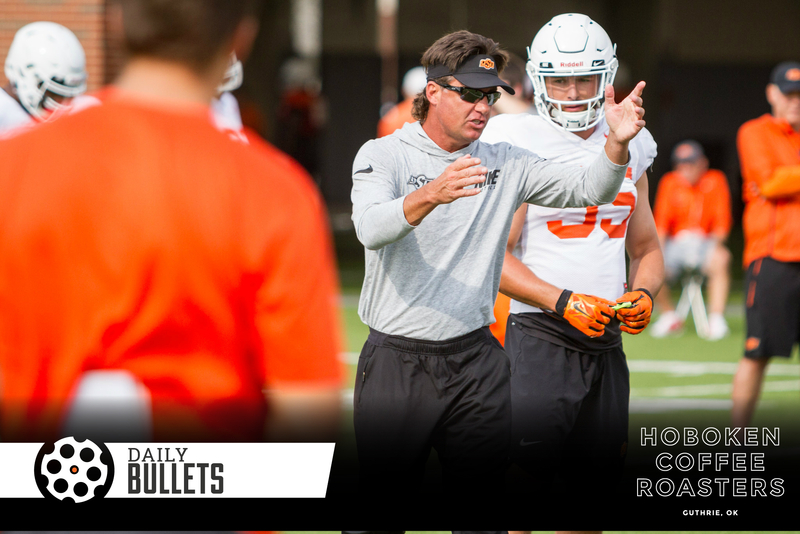 • In a recent interview with Bill Haisten of the TulsaWorld, Mike Gundy answered some serious questions – I’ll be highlighting his answers for a week. “It would take forever to tell you,” he said. “I got out of my box on handling things as I should. I just thought everything would work itself out, and I wasn’t as disciplined (in making corrections). The change agent in the wins per the head man himself is a different type of involvement from his chair. Does that mean a more hands-on coaching approach when an issue presents itself? A general deviation from the laissez-faire approach responding more to inquiries with a “we’re fixing it now” than a “we’ll see in a month” would come across better. • Going into the last day of the Masters, Rickie Fowler is in range to compete for his first major win. Tiger is lurking as the last day begins and there’s plenty of money on the line, here’s to Rickie shedding the prestigious title. • There was an interesting detail wrapped up in the ESPN-Big 12 TV rights deal announced this week and it has to do with a new ability the coach has. There will be one football game, each season, that will be on the package with ESPN+ and it can be moved to any of the ESPN platforms, but if it is streamed, Gundy could pick the time out. This season’s game will be the McNeese State at OSU game on Sept. 7, likely a 7 p.m. kickoff, but Gundy has always said he has his favorite kickoff time. I like the 1:30 p.m. kickoff – it gives folks time to travel on both sides of the game (plus prevents a late night). • I agree with this on-field ceiling for CJ Moore at wide receiver. “He is kind of in that Marcell Ateman role,” Cowboys coach Mike Gundy said last week. “He is nowhere near where Ateman was when he finished, (but) has some of the skills Ateman had early in his career. We’ll see what a taller Patrick McKaufman can do but Moore appears to have that high-end capability (big, athletic receiver) that Ateman had in Stillwater. • Here’s what it will really cost the Boston Celtics to be without Marcus Smart early in the playoffs. Smart would have matched up against the Pacers’ Bojan Bogdanovic in the first round. Bogdanovic is averaging 18 points per game this season on a blistering 42.5 percent from 3-point range. The Pacers are without Victor Oladipo and the series is still more than winnable for the Celtics. And that’s a big loss – losing an All NBA-caliber defender on the wing capable of shutting down an opponent’s primary scorer. • This is cool – Hovland has been doing a diary for Golfweek at the Masters. He had himself an up-and-down third round on Saturday. #okstate's Viktor Hovland with an eventful third round: 6 birdies, 5 bogeys, he's -2 (T-32). He's one shot clear of Takumi Kanaya for low amateur honors going into Sunday. Hovi's had a heck of a week in Augusta. • Which Thunder team will show up in Portland today?